I just wanted to take a moment to thank all of the staff at DRC for an absolutely AMAZING week at Dolphin Camp. From the moment we began the process from payment to pick up, everthing was easy, fun and professional. Lydia has visted DRC pretty much every year since she was a few weeks old. 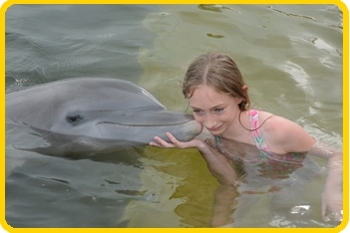 When she was 3 she did a Meet the Dolphin experience....and overheard Ma and I speaking about Dolphin Camp. She instantly said she wanted to go...next year. We explained she was only going to be 4, and had to be 10 in order to attend. Lydia was very sad!! She has asked us literally every year if she can attend. In the meantime reading books about dolphins and increasing the size of her stuffed animal pod, naming them with all of the dolphins at DRC. When Sandy Hook happened Lydia lost a very dear friend from 4 years of preschool. When I had to tell her, she was holding a dolphin she had gotten from DRC she named Rainbow. 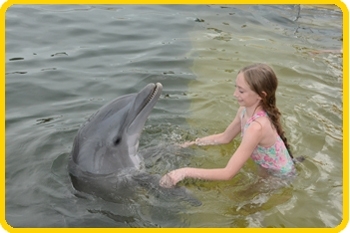 Although Lydia is a happy, normal 10yr old, I will honestly tell you the HAPPIEST I have seen her, the most animated I have seen her, the most talkative I have heard her and the most independent I have seen her is during and after Dolphin Camp. She called every night, not homesick, but to tell about what she had learned, who she had worked with, and what silliness had transpired during the day. 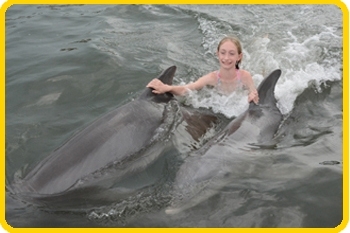 It was obvious there was a perfect balance of learning, dolphin interaction and just plain ole fun! I am sure much of that was due to careful planning, however it is not lost on me that caring staff plays a huge part in the success of a program like this. After camp was over Lydia and I traveled down to Cudjoe Key. On TV she saw an interview with Dr. Vaughn of the Mote Marine Lab Coral Reef restoration project. She saw the lab was on Big Pine Key and asked if we could go visit. I didn't know if they did tours or not but figured if a 10 yr old is interested it won't hurt to try. So the next morning we drove up and walked in. I asked one of the research techs if they did tours. "Well not really, we only opened the building two weeks ago and aren't really moved in or set up yet...." an obviously senior researcher over hears the conversation and bends down to Lydia. "Are you interested in the Ocean?" 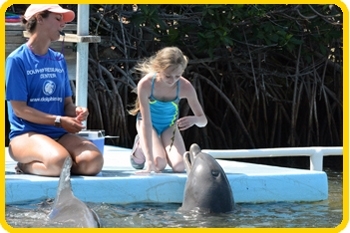 he asks...she giggles "Yes I just spent a week at Dolphin Camp." "Well then I'll show you around." And he proceeds to take us all through the labs in the building, has techs show Lydia how they cut glue and graft the coral, all the while Lydia asking surprisingly good questions: " is the water filtered? where does the sea water come from? Why from a well? Why after that from the ocean?" Finally towards the end of the tour Dr. Vaughan walks over and introduces himself to Lydia. He asks why she is interested in coral reefs and why they are important. Without missing a beat Lydia stands up tall and straight...looks at him right in the eye... and begins "Well if you think of the earth 80% is covered in water, so that means that most of the world's oxygen comes from the ocean...and it comes mostly from two places, plankton and coral reefs. Plus coral reefs are sorta like a nursery for baby fish and baby sea life...so it's where everything begins." Impressed, Dr. Vaughan asks..."why do you think the reefs are dying?" She pipes up "possibly warming....possibly the ocean becoming acidic, probably both." He looks at me...puzzled...and asks "Did you tell her that?" My answer...."Heck no I didn't even know that!!" Lydia pipes up..."I learned it last week, at DRC." To read more inspired comments from students of all ages.